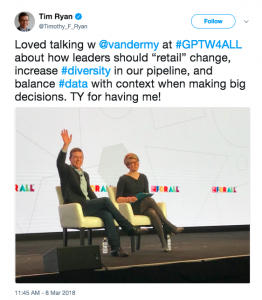 Workday recently celebrated workplace diversity and culture at Great Place to Work’s summit in San Francisco. The three-day Great Place to Work For All Summit was an opportunity to come together, share ideas, and hear from company leaders who are innovating HR practices, management strategies, and using technology to solve difficult issues with hiring and inclusion. The major theme of the conference was how to make actionable change in the workplace to help create a better employee experience. Conference attendees heard from several top business executives, who shared stories about problems they faced, how they discovered them, and what changes they decided to make for the better. During a fireside chat, Workday Co-Founder and CEO Aneel Bhusri detailed the difficulty of hiring and developing quality managers during times of high growth. After reading Glassdoor reviews and sorting through extensive employee survey data, Workday’s senior leadership team realized that not all employees were having a consistent experience. To improve the employee-manager relationship and ensure all managers were leading with the same values, Workday brought together every people manager at the company in a People Leadership Summit. The summit’s goal was to develop better management skills and ensure a great experience for employees, lessons that leaders have put into practice on a daily basis. Tim Ryan, U.S. chairman and senior partner at PwC, talked about a favorite initiative to make their workplace a more inclusive space for employees. PwC decided to stop requiring unconscious bias and diversity training, with the goal, paradoxically, of encouraging employees to do the training. Requiring it, Ryan said, makes unconscious bias training seem like just another check-the-box HR policy and doesn’t encourage real change across the organization. Instead, PwC tied unconscious bias training to new hires and promotions. This way, the skills needed to create more diverse teams come along with the leadership development journey instead of being a compliance requirement. In a session on future-proofing your business, Atlassian global head of diversity and inclusion Aubrey Blanche talked about building diverse teams at scale. Atlassian, an Australian company with offices around the world, relies on data to ensure diverse and inclusive teams in every region. Blanche shared an example of a hiring problem they were facing in Australia where there were far less women than men in technical roles. In order to attract more women, Atlassian used technology to uncover unconscious bias in their job descriptions, standardized interviews by asking all candidates the exact same questions, and hired for “value fit” instead of “culture fit,” seeking to avoid only hiring people similar to current employees. After making these seemingly minor changes, the percentage of women applying for technical jobs increased by ten percent. Salesforce chief equality officer Tony Prophet said he believes that in order to feel empowered to grow and thrive at your company, you need to feel like you’re a part of a community. This is why Salesforce established Ohanas (a nod to Marc Benioff’s love of Hawaii), for people with similar backgrounds or interests within the company. Instead of being exclusive, however, Ohana groups encourage allies (those who don’t necessarily share a certain identity) to join in the hopes of encouraging more open conversations about traditionally charged issues such as gender, race, sexuality, and religion. During his closing keynote, Prophet summarized the sentiment of the conference by sharing the five leadership principles he uses to guide his work: lead with equality; have brave conversations; practice inclusion in promotions; celebrate and bond with everyone in mind. All told, it was an inspiring, energizing conference that gave attendees more tools to create a great place to work—for all.